The USFL originally intended the Los Angeles Express to be a key franchise, placed in the country's second largest market. Two and a half years and nearly $30 million after the team hit the field, the Express had become a ward of the league, dependent upon the USFL's other team owners for survival. The USFL took over the Express prior to the 1985 season after owner J. William Oldenburg proved unable to pay the franchise's hefty bills. The 1985 Express were for all intents and purposes operated by Commissioner Harry Usher. 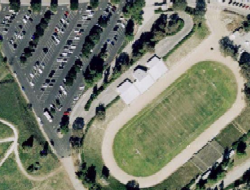 Usher, who rarely attended his own league's games, grew tired of seeing the Express draw minuscule crowds to the cavernous Los Angeles Coliseum, and at the end of the season he decided to experiment by moving a game from the Coliseum to the home field of tiny Pierce College in Woodland Hills, California. If nothing else, Harry Usher would be the first to bring pro football to California's San Fernando Valley. "the football field." The Express took on the Arizona Outlaws before an announced crowd of 5,500 - and promptly lost, 21-10. A week later, the Express would play their final game, another loss, on the road in Portland.